Here at College Sports Journal, we have been covering the Division I FCS football sub-division with most of us here have followed this area for over 15 years. We are now looking to expand our football coverage to bring to the so-called lower half of the FBS ranks—the named Group of Five. 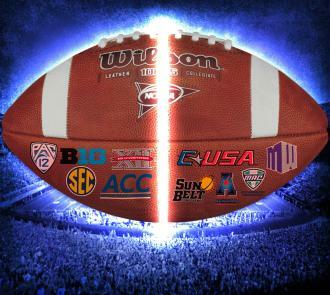 The Group of Five include the five conferences outside of the named Power Five Conferences. 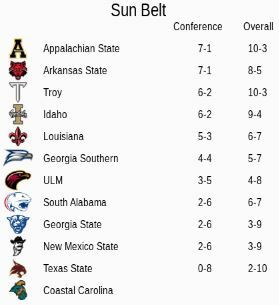 The Group of Five includes the American Athletic Conference (AAC), Conference USA (CUSA), the Mid-American Conference (MAC), the Mountain West Conference (MWC), and the Sun Belt Conference (SBC). To note, the Power Five Conferences include the Atlantic Coast Conference (ACC), Big 10 Conference (B1G), Big 12 Conference, the PAC-12 Conference, and the Southeastern Conference (SEC). The FBS ranks also have a number of Independent teams with the most notable being Notre Dame, who is classified with the Power Five Conferences and three others that we will classify in our Group of Five coverage in Brigham Young (BYU), Army, and Massachusetts (UMass). Here is a look at all the schools and conferences that we will cover with last year’s standings (note if there is no record, the team is new to FBS this year, which includes Coastal Carolina and Alabama-Birmingham (UAB)). Why are we looking to expand our coverage? The expanded coverage really is similar to what we felt the FCS ranks has—limited exposure. The Group of Five schools in many fans and media types seem like a different division than their FBS brethren—the Power Five. Over ten years ago, one statement from former Big Sky Conference commissioner Doug Fullerton told me in an interview that really there are already three Division I sub-divisions and really it is no different today and in many ways, even more of a division within the FBS ranks. As many will recognize also, there are several FCS-move-ups in the past 15 years that involve schools we have covered—namely Georgia Southern and Appalachian State. Those two schools combined to win nine FCS national titles (Georgia Southern (6), Appalachian State (3)). But there are others also now in the Group of Five that got their start in the FCS ranks and also won a national title including one of the most pronounced Group of Five school in Boise State. 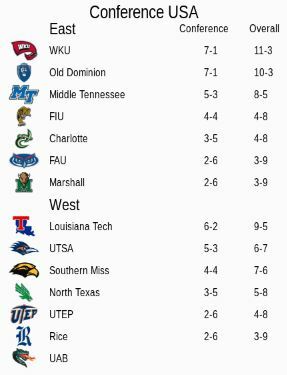 UMass, Western Kentucky, Louisiana-Monroe (named Northeast Louisiana previously), and Marshall, who won two FCS national titles before moving up. There are also others without titles but still moved up after getting starts at the FCS level. See the map on the below to see all the FCS-to-FBS move-ups. In fact, a total 29 of the current 65 schools that make up the Group of Five had at least a start in the FCS ranks. What do the Group of Five schools play for? When the Bowl Championship Series (BCS) was replaced with the College Football Playoff starting in the 2014 season, the argument was made that any school in the FBS ranks could be one of the four top schools to make one of these spots. 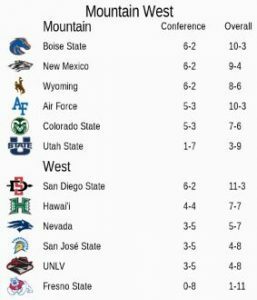 But it would take an undefeated season and some unforeseen things in at least two of the Power Five Conference teams to keep the four schools coming from four of the five so-called major conferences. 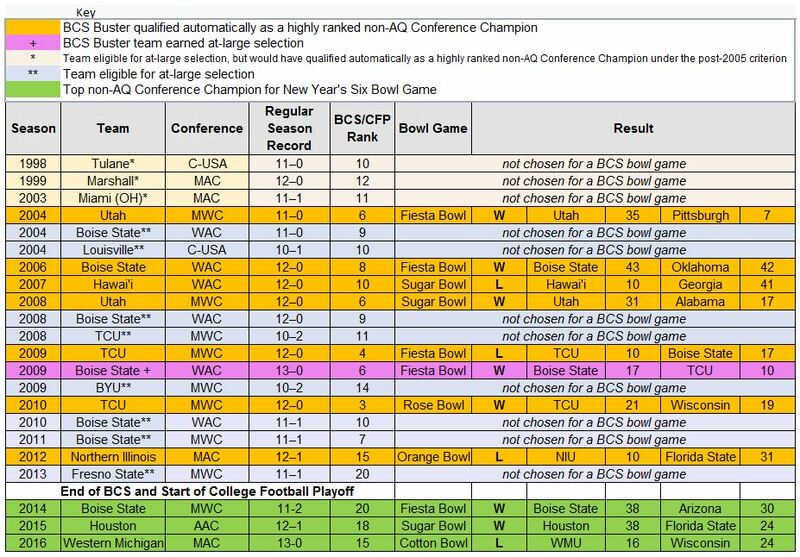 This can be seen in the stats since the BCS started and so far what the College Football Playoffs have done. Even an undefeated team in the Group of Five schools will not be considered for one of the four playoff teams. So really what the Group of Five schools get to play for of course is conference championships and the right to a bowl game. And as long as one of the Group of Five schools ranks in the CFP Top 25, that top school will get a bid to a New Year’s Six Bowl Game (Rose, Sugar, Fiesta, Peach, Orange or Cotton Bowls). 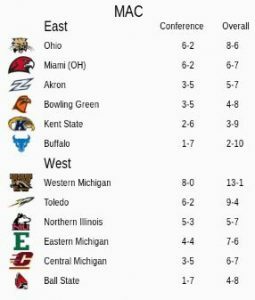 Like was seen last year, Western Michigan finished the season undefeated and met the criteria so the Broncos went to the Cotton Bowl against Wisconsin. 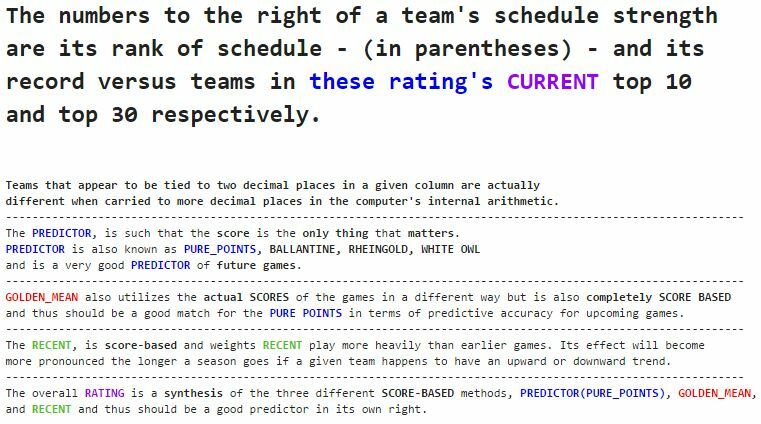 Some have speculated that the Group of Five schools will want their own playoff but while some conference in the Group of Five have aired they want this, others do not. We will have to wait and see what happens but personally, I think this is a likely scenario coming. What are the other bowl game ties for the Group of Five Schools? What more will CSJ do this year to cover the Group of Five schools? 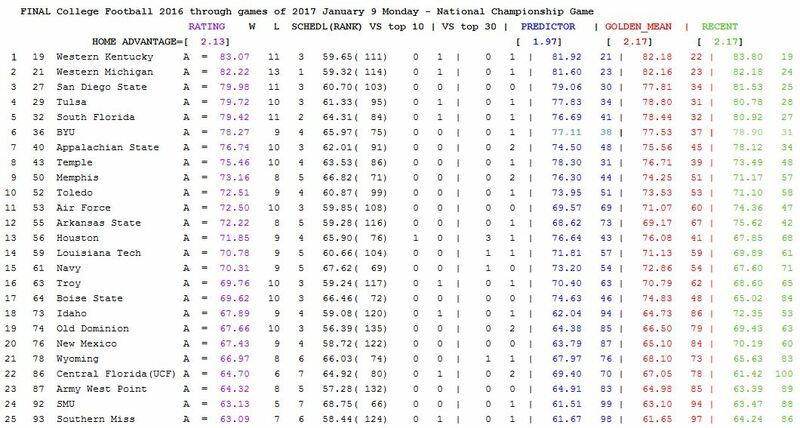 At CSJ similarly to what we already do for the FCS ranks, we will recognize a weekly list of top performers and compile at Top 25 ranking based on the Sagarin rankings. An example of this is the rankings shown at the yearend for the Group of Five. In the rankings, you will see the the full rankings first and the overall Division I ranking to the right of the the FCS ranking. 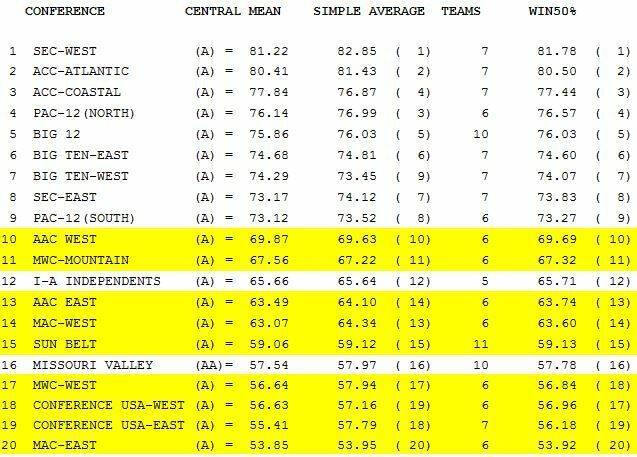 The following are the individual conference rankings and the overall rankings within overall ranking in Division Ie with the Group of Five Highlighted in Yellow. 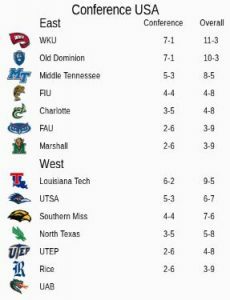 Surprising, Western Kentucky would have been the mythical Group of Five national champion last year after the Hilltoppers 51-31 victory over Memphis in the Boca Raton Bowl. 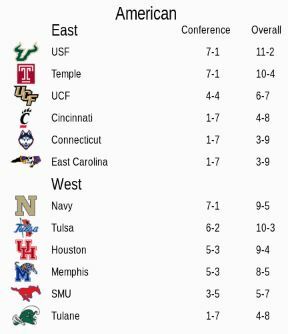 WKU’s division in the AAC was rated as the top conference in the Group of Five. Over the next couple of weeks we will have more special coverage of the Group of Five schools. We hope all fans enjoy the coverage.